(CNN) -- Students and teachers from a Maryland private school who were quarantined in China because of swine flu concerns have been released, the mother of one of the students told CNN's "American Morning." 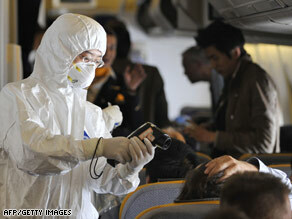 Chinese health authorities prepare to take temperatures of passengers on a plane from Germany this week. "I've heard both from my daughter and from one of the teacher chaperones. They are quite excited," said Alesia Peterson, whose 15-year-old daughter Erica is one of the 21 students on the trip. "They had their temperatures taken. They were all normal. So they were allowed to leave. They boarded a bus which was filled with flowers and gifts and they're heading on to their next destination." The Chinese government quarantined the students from Barrie School and their three teacher chaperones at their hotel because a passenger on their plane to China was suspected of having swine flu, said Vicky Temple, the director of communications for the school. Mike Kennedy, the head of Barrie School, said U.S. consular officials have since told the school that the plane passenger does not have swine flu, or H1N1. Kennedy said the students were kept in their hotel rooms -- on two floors of a four-star hotel in Kaili, part of Guizhou province in southern China -- since about noon Monday. The students are scheduled to return to the United States on Sunday. "They've missed the lion's share of the itinerary," Kennedy said Thursday. "It's very frustrating," he said, but added, "I understand, and I'd like to say that the Chinese officials have been as kind and friendly to our kids and chaperones as they can be." China's state-run Xinhua news agency reported that the Guizhou Province's health bureau announced earlier this week that it had discovered two dozen Americans who had been within four rows of the suspected swine flu, or H1N1, case on the plane. The plane had departed from San Francisco, California, on Friday. While in quarantine, some of the students had roommates, others did not, said Peterson, who told CNN she got information from the teacher chaperones. The kids were allowed to have their doors open and speak across the hall. They were also allowed to use the phones and had e-mail access. Chinese authorities delivered three meals a day in baskets. To try to stay entertained, some kids used those as makeshift bowling balls. Asked whether she was upset about what happened to her daughter's trip, Peterson responded, "I'd have to say they're visitors in a foreign country. And as such, we have to adhere to whatever the rules of the foreign country are." She added, "I actually had just some concerns as a parent would have. But I have absolute confidence with the teacher chaperones that were there and had been monitoring and keeping us informed the whole time." Peterson has offered her daughter a future trip overseas to help make up for this one. "I think we might have to wait a few years. If she would like to go back to China, I would love for her to do so." State Department spokesman Ian Kelly said in an afternoon briefing that he was aware of the report but said he didn't have details on the circumstances or what the U.S. officials might be doing about it. CNN's Brian Todd and Taylor Gandossy contributed to this report.